Hello everyone! Hope you are enjoying the Papertrey Ink Anniversary Celebration so far. Today the Design Team is sharing their most favorite Papertrey Ink project from last year. To me, this is as perfect as a single layer card gets. Not a single embellishment insight, but the card is in no way boring. Lately, I find my self turning to Rustic Cream card stock more and more, as an alternative to a white or cream card base. The tiny visible flecks of fibers keep things interesting. 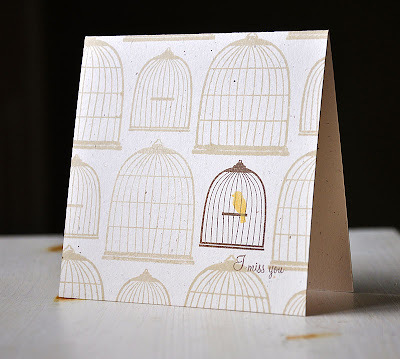 I love the subtle pattern I got when stamping the two bird cages (from Love Birds) in Vintage Touch Chai ink; it adds interest with out distracting from the focal point. 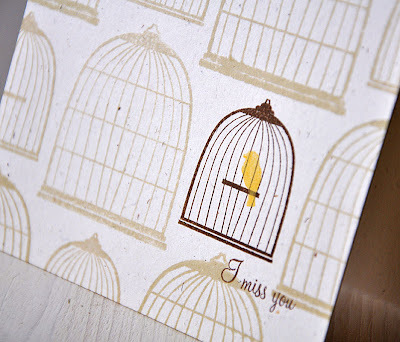 A pop of color from stamping the small cage, in Dark Chocolate, and a lonely bird, in Lemon Tart, makes the perfect focal point for the "I miss you" sentiment (all from Love Birds as well). Also, be sure to visit Nichole's blog for a super fun challenge and the chance to win the "Ultimate" Card Kit!!! i adore this card, Maile. you are such an inspiration! Thanks for your inspiration!! I love your simple one layer cards! When I am in a hurry your style suits me!! You show me how to step out of the box with your one layer style. Thank you! Oh, you are always a blog I check often. I adore your style and eye for stunning simplicity. It's a perfect, perfect card. Congrats on a great year with PTI! This project was one of my favorites too! It inspired a "Happy Anniversary" card I sent out recently. Thanks so much for your continuing inspiration to this novice card designer. I hope your next year with Papertrey will be even more successful and happy! 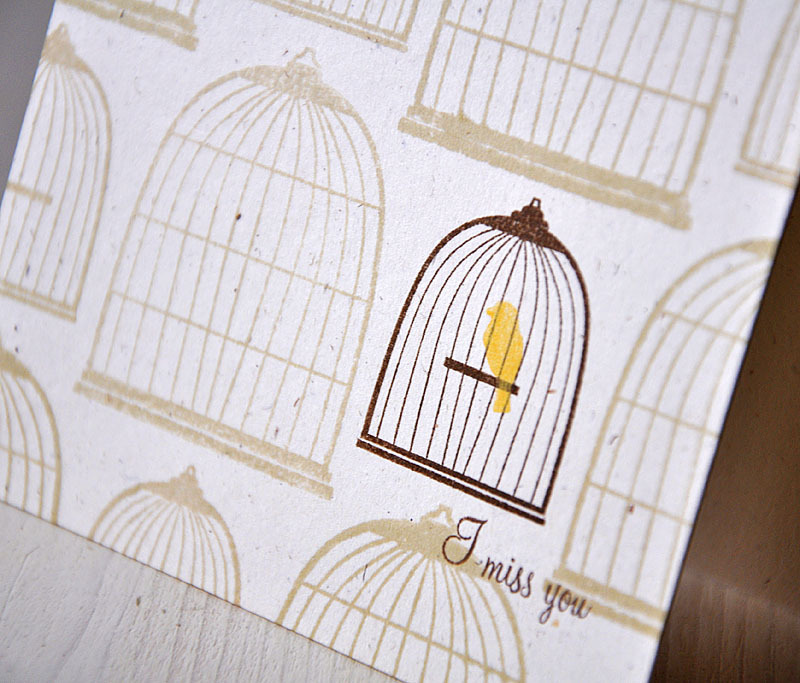 I do love the TRUE feeling you have invoked on this "Miss You" card. You have really captured the feeling ... 100% talent there. Thank you for sharing your creativity. I will be back to visit again! This card was my favorite of yours, too. I remember gasping when I saw it. I'm so glad you're a part of the PTI team. Your clean and simple style makes the products shine! This is a fabulous stamp set and this card is just fabulous. Simple, yet bursting with strong emotion. I love your work and love your blog. You inspire me. Great clean card. I love this stamp set too! That said, I would pick this as a fave too - in fact it was this card that pushed me over the edge to buy that set! You have such sweet, subtle touches on every project that are uniquely you. Love your work! This card is very sweet. Thank you for sharing. Love this card, it is a classic!!!! Thanks for all your hard work and the extra effort that you do! !